Do you enjoy spending a sunny day at the Indy 500 or a Nascar race? Experienced car racing fans may walk around the track before they head to the grandstand. But for newbies, your first car race should be exciting, crazy, and maybe a little scary. It will certainly be something you will never forget. Many ask for advice on what to do, what to see, and what not to do when they attend their first big racing event. Be prepared for a lot of action and family fun. The races are loud … really loud. It’s important for children and adults to wear ear protection, sunglasses and hats. The track gets very hot from the sun but you can stay cool and shaded under your portable sun shade umbrella. During intermission, most racing cars pull onto the track where fans are allowed to meet the drivers, and even climb into a few of the cars! Anyone have a camera? General admission tickets for the bleachers provide a great view of the race, but are hard metal seats with no back support. Many people bring their own stadium chairs to set up in the bleachers with their portable umbrella for extra comfort! Sun safety is very important for a day at the races. It’s best to bring along sunscreen and plenty of water to make sure you have an enjoyable day. 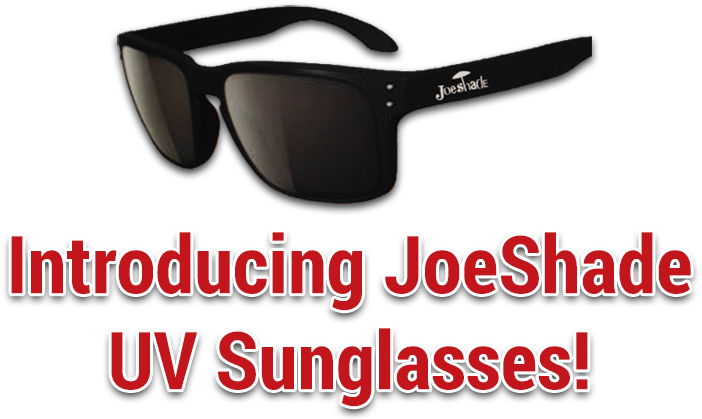 Let JoeShade® portable sun shade umbrella keep you cool and protected while you cheer on your favorite driver!